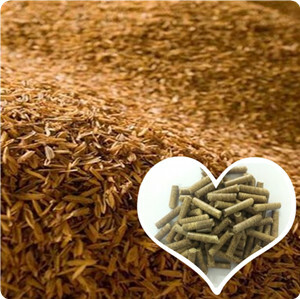 Why Choose Rice Husks to Make Biomass Pellets? Rice husk accounts for around 20% of paddy weight, and about 770 million tons husks are produced in Asia annually. However, most rice husks are discarded as wastes or burnt directly, not only polluting the environment, but easily resulting in fire. As one of the most common agricultural wastes, abundant rice husks can be good raw material for biomass pellets. When burning directly, rice husk pellets release less amount of ashes and emissions. The diameter of rice husk is about 2-3 mm, so they do not need to be crushed before pelletizing. In addition, the low moisture content of rice husk contributes to the pelletizing of rice husks. * High-precision gear drive makes the production increase 20% compared with belt drive. * Imported high-quality bearings & oil seals, better transmission efficiency, stable operation, and less noise. * The feeder adopts frequency conversion motor, feeding continuously and evenly. * Multiple hole diameters for option, ring die is made of stainless steel, with features of corrosion resistance and long service life. * The international advanced spring coupling has advantages of novel and compact structure, high safety, less noise and low breakdown. After discharging from pellet mills, rice husk pellets may be 90 degree Celsius. The high temperature can not only result in cracking and breaking of pellets, but inconvenient to store and handle. Our cooler can manage this process effectively. *Adopts counter-current cooling principle, avoiding the direct contact with cold air and hot-pellet, preventing pellet surface cracking. *The latest octagon cooling cabinet design ensures no cooling blind angle. *Closed air entering system, large inlet air area and obvious cooling effect. *After cooling, the rice husk pellet temperature is not higher than room temperature 3-5℃, suitable for storage. The packing process is important to protect rice husk pellets from damp and dust. *No weighing hopper structure, compact structure, convenient installation. *Adopts all-digital intelligent weighing control instrument, with the features of high weighing precision, high speed, simple operation, stable and reliable performance. *The instrument has various functions, including auto-peeling, zero tracking, out-of-tolerance alarm, communication, and calculation of gross weight, net weight and bags. *Reasonable design for easy maintenance. If you are intended to establish your career to make fuel pellets from rice husks, please do not hesitate to contact us for details.